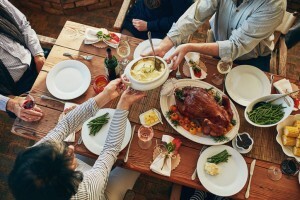 Thanksgiving is always the perfect opportunity to gather with friends and family to celebrate. However, being the hostess with the mostest can be quite a daunting task. But have no fear, we are here to help you create the most delicious dinner that your guests will rave about for years. 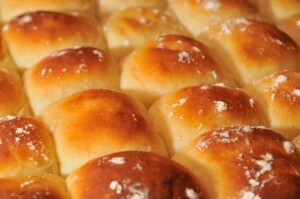 We will start with the easiest and biggest crowd pleaser, the bread! Whether you like classic rolls or flaky biscuits, below are two simple and beloved recipes for these favorites. Place milk in a small saucepan and bring to a simmer. Remove from the heat, stir in the butter and sugar and let cool. Dissolve yeast in warm water and let sit until foamy. Combine milk mixture, eggs, yeast, salt, and 1/2 of the flour in a mixer with the dough attachment and mix until smooth. Add the remaining flour, 1/2 cup at a time, and stir until a smooth ball forms. On a floured surface, punch down the dough and shape into desired shapes. Place on a parchment paper-lined baking sheet. Cover again and let rise until doubled, about 30 to 40 minutes. Using a knife or bench knife, cut your butter into marble-sized pieces. Store the cut butter in the refrigerator until you’re ready to combine it with the other ingredients. In a small bowl, whisk together buttermilk, cream, and whole egg. Add butter to flour mixture and toss until fully coated. Working quickly and using your fingers, rub butter into flour until butter forms marble-sized pieces. Alternatively, add flour mixture and butter to food processor and pulse 2 to 3 times to form marble-sized pieces; transfer to a large bowl. Add buttermilk mixture and gently mix with a fork until just combined; the dough should look somewhat dry and shaggy. Cover and let rest in the refrigerator for 30 minutes. Turn out the dough onto a lightly floured work surface. Form dough into a rectangle, lightly pressing and folding to bring it together; avoid squeezing or kneading the dough. Return dough to work surface, and, using a 3-inch round cookie-cutter and pressing down without a twisting motion, cut out biscuits as closely together as possible. Gather together scraps, pat down, and cut out more biscuits; discard any remaining scraps. 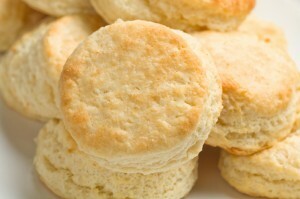 Brush the top of each biscuit with egg-wash.
Bake the biscuits in a 400°F oven until risen and golden, about 15 minutes. Let cool slightly, then transfer to wire rack. Serve warm or at room temperature. Now for the main course, the most highly anticipated part of every Thanksgiving dinner, turkey! Make it juicy and cooked to perfection with these recipes. Whether you like your bird deep fried or roasted in the oven we have you covered. Rub turkey all over with House Seasoning. Coat turkey with dry rub. Allow the bird to sit until it reaches room temperature. Heat peanut oil in a turkey fryer or a very, very large stockpot to 350 degrees F. Lower turkey into hot oil, very carefully, making sure it is fully submerged. 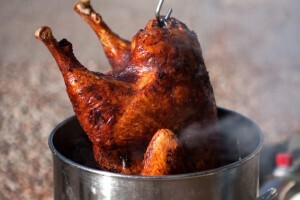 Fry turkey for 3 minutes per pound plus 5 minutes per bird. Remove turkey from oil and drain on paper towels. Serve with favorite Thanksgiving sides and salads. 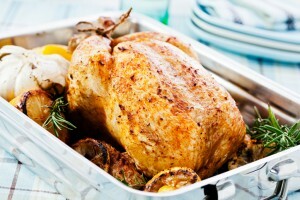 Heat oven to 375 degrees F. Working on a baking sheet, remove the giblets and neck of the turkey from the cavities. Reserve the neck and discard the giblets. Using paper towels, pat the turkey dry. Stuff the garlic, lemon, half the onions and 10 sprigs thyme into the main cavity. Place the turkey neck, carrots, celery, the remaining onions and the remaining thyme in a large roasting pan. Place a roasting rack in the pan and put the turkey on top of it. Carefully tilt the turkey to empty the juices from the cavity into the pan. Transfer the turkey to empty the juices from the cavity into the pan. Transfer the turkey to a carving board. Cover loosely with foil and let rest for at least 25 minutes. Reserve the pan and its contents for gravy. Carve the turkey and garnish with herbs as desired. If you are still hungry after filling your belly with delicious rolls, turkey and countless other fixings then we have two desserts that are sure to tip all your guests over into a food coma. 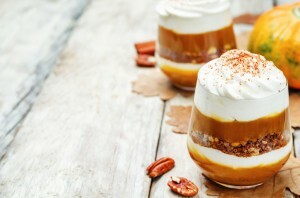 Sick of pumpkin pie but can’t get enough of that holiday pumpkin flavor, try out these recipes! Whisk together flour, baking powder, baking soda, cinnamon, ginger, nutmeg, cloves and salt in a large mixing bowl until combined. In a separate bowl, whisk eggs and granulated sugar for 1 minute until thick. Add in the vanilla and pumpkin, and whisk until just combined. Fold in the flour mixture with a rubber spatula, and stir together until just combined. Spread the batter evenly into prepared pan. Bake for 13 to 15 minutes, or until top of cake springs back when touched. Carefully lift the parchment paper and cake out onto a flat (and heat-safe) surface. Then slowly, use your hands to roll the cake — rolling from the short end to the short end — until it is completely rolled up. Transfer the cake roll to a wire rack, and cool until it reaches room temperature. While the cake is cooling, make the cream cheese filling (see below). Once the cake has reached room temperature, transfer the cake roll to a flat surface, and carefully it until it is flat again (or mostly flat, it’s ok if the ends curl up a bit). Spread the cream cheese mixture evenly over cake, leaving a 3/4-inch border on all sides. Then carefully re-roll the cake, gently peeling away the parchment paper as you roll until you can completely remove and discard it. Tightly wrap the pumpkin roll in plastic wrap and refrigerate at least one hour. Remove and unwrap the pumpkin roll and transfer it to your serving dish. Lightly dust the pumpkin roll on all sides with powdered sugar, if you would like. Then slice and serve. 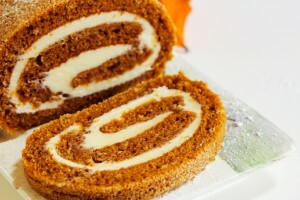 If you have leftovers, just re-wrap the pumpkin roll in plastic wrap and store in the refrigerator for up to 3 days.